to a packed house at Waterford Healing Arts Trust on Thursday 8 June. Thursday’s Child is available to purchase from Waterford Healing Arts Trust at University Hospital Waterford, price €10. 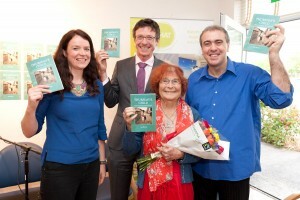 Claire Meaney (WHAT), Dr Sean Leavey, author Liz McCue and artist Philip Cullen at the launch of Thursday’s Child. Liz McCue said that publishing Thursday’s Child is “a dream come true”, adding “It was tough, but I kept going. I’m not a defeatist – I have so much more to do – and I am very grateful to everyone who helped me to make this happen: Philip Cullen, Brenda and all the staff at the renal dialysis unit, and Waterford Healing Arts Trust”. WHAT has been running an arts programme in the renal dialysis unit of UHW since 2007, supported by the Punchestown Kidney Research Fund.